You’ve made the decision to get nose surgery (rhinoplasty), and you’ve made the right choice in Beverly Hills Plastic Surgery Group. Dr. John Layke is our double board-certified, Patient’s Choice Award-winning plastic and reconstructive surgeon, as well as a top rhinoplasty specialist in Beverly Hills, working with his partner Dr. Payman Danielpour for over 7 years and counting. 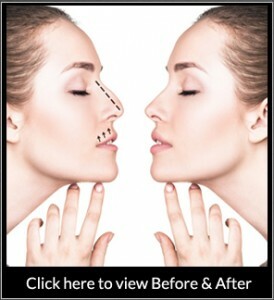 You’ve made your choice, and you want to get the rhinoplasty procedure done. It could be for cosmetic reasons, but it could also be due to compromised sinuses or clogged airways through the nose, or maybe a deviated septum. Either way, it’s important to make certain preparations to make sure that the procedure itself goes smoothly, and that the rhinoplasty recovery process is as comfortable as possible. It’s important to make sure you plan accordingly for your nose surgery procedure in Beverly Hills. That means taking the day of surgery off from work or from your familial obligations. But it also means budgeting your time accordingly, and taking at least one week off from work. Planning for some downtime will make your transition and healing more comfortable. It will also minimize the risk of compromising your new nose structure. Make sure that you stop using aspirin, ibuprofen, vitamin E, and herbal supplements two weeks before (and two weeks after your surgery). Stay away from anything that thins the blood. If you’re a smoker, stop smoking for 2-4 weeks before surgery, because nicotine will slow your healing. You can even use it as a springboard to finally quit smoking for good. Pro tip: stock up on any prescriptions you need before your surgery date, so you don’t have to go out to get them. Having a friend or partner at your side the first two days after your nose surgery is invaluable. Keep them there for support, to grab you beverages or lip balm, and to keep track of your medication schedule, if you do in fact need pain medication. Make sure that you discuss your circumstances with Dr. Layke, any previous medical conditions, and what you hope to accomplish with your rhinoplasty surgery. It’s important for you and your rhinoplasty doctor in Beverly Hills to have a game plan. You will not be able to drive yourself home after your rhinoplasty surgery. It’s a good idea to have somebody come with you for the procedure, and to have this same person take you home, so we can discuss your situation and aftercare with them. We don’t want you doing any heavy lifting, because it can compromise your new nasal structure and ruin your rhinoplasty surgery. Stay away from doing anything strenuous. If you have a cluttered living space, get it in order beforehand, so you aren’t tempted. Wear a button-up shirt, because they’re better than those pull-over-your-head options. You’ll want to wear button-ups while you recover as well. If you take proper measures before your surgery, it will ensure that you experience the least amount of discomfort and enjoy amazing results from your nose surgery. We hope some of this helps! If you have any lingering questions or concerns about the procedure, contact Beverly Hills Plastic Surgery Group today. If you haven’t yet, schedule your initial consultation; we’d be happy to put your mind at ease and set you up for success during and after your rhinoplasty treatment.